The North American Handmade Bicycle Show (NAHBS), the world's largest trade/consumer show for custom-built bicycles, is gearing up for one of the greatest celebrations yet of the art, craft, and innovation that is encompassed in the world of bicycle framebuilding. After two years in San Jose, California, the 2008 show will be held in the Oregon Convention Center, Portland, Oregon, February 8-10. 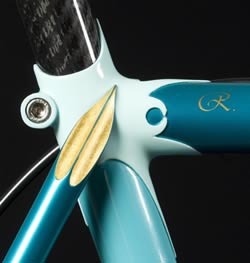 Show director, Don Walker, the founder of NAHBS and an esteemed builder of 10 years himself, says "on display will be the most beautiful objects in the cycling world, and I mean the whole cycling world. I have it on the authority of a respected British journalist that US builders are currently regarded as the cream of the international crop in bespoke frame making. For anybody who's even remotely into bicycles, or design, or engineering, this is a 'do not miss' event." The array of beautiful bicycles will not only be rich, but vast. The show, which is gaining in popularity at an astonishing rate, has 92 exhibitors registered already. This is only 11 short of last year's total of 103. Booth space sales are already close to the '07 figure of 130, and with seven weeks of registration remaining it is possible that all 200 both spaces might sell out. Exhibitor registration closes December 15, 2007. Among the busiest booths are likely to be those of the carbon fiber master Nick Crumpton, Tony Pereira (winner of the Best Filet Brazed, Best Road, and Best Off-Road categories at the 2007 NAHBS), Coconino, Rock Lobster, Brian Baylis (see photo below) and of course Richard Sachs, who has a six year waiting list for one of his frames. As the show continues to grow in size and status, Walker increasingly sees it as a venue for key manufacturers to reach their target audience. "As a sponsorship vehicle, the NAHBS show provides a two-fold opportunity. First of all, it is a place for the more upscale manufacturers to engender some brand loyalty - afterall, people just love this show and those that help provide it. Secondly, NAHBS is a unique opportunity for people like component manufacturers to connect with the handmade bicycles industry to find out the innovative ways their components are being used - uses that the large scale manufacturers would never conceive. These are the flagship display bicycles for component makers." The North American Handmade Bicycle Show is dedicated to showcasing the talents of individuals around the world whose art form is the bicycle. It aims to be a gathering point online and in person  for framebuilders and consumers looking for custom-made bikes, for the sharing of ideas and promotion of this industry and its traditions. After three years of growing by leaps and bounds, NAHBS 2008 will feature still more exhibitors, consumers and a wealth of seminars. For more information, see www.handmadebicycleshow.com.